Would you like to write missions for Top Secret: New World Order™, either as an author published by TSR®, or as a publisher of your own work? If your submission is accepted, a contract and schedule will be provided for your approval. From there you will move on to writing the mission. Finished mission modules are expected to be roughly 12–15,000 words in length, so don’t try to write out the entire mission module before you receive a contract! We will read all submissions within 30 days of reception, and let you know if we’re interested in publishing your module. Please limit entries to one mission module per submission, and avoid sending work that has been published elsewhere (in print or online). We are always looking for new writers, so don’t hesitate to send us your submissions! 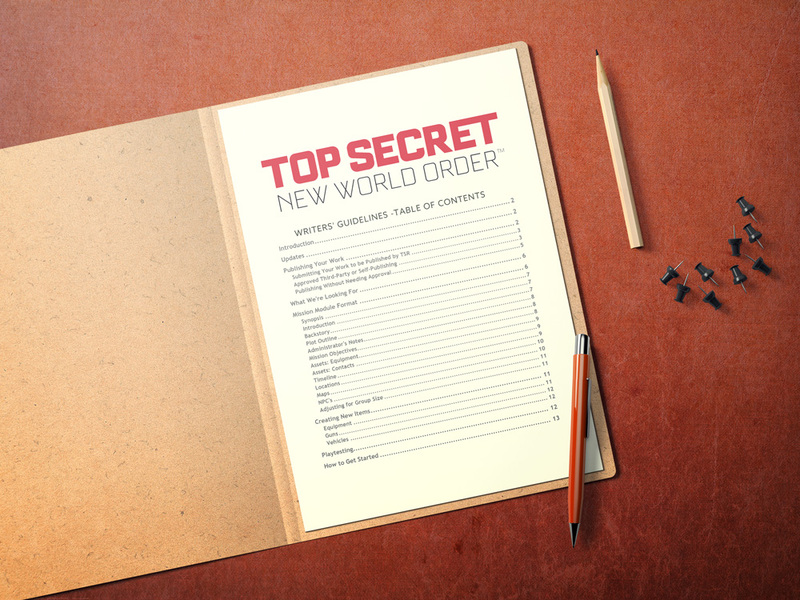 If you’re interested in publishing your own missions or other material for use with Top Secret: New World Order, please contact jayson@tsrgames.com for more details. We are currently getting licensing guidelines and contracts prepared, and they will be available soon. Licenses to publish third-party material for Top Secret NWO will always be free of charge. The first version of the writers’ guideline document is available below. This version does not yet include detailed setting information about the Top Secret NWO world; that will be included in Revision 1.2. Download the writers’ guidelines here.